As you read this (well, if you’re reading this when I posted it) I’m on my way to New York. I’ll likely be offline for the weekend, but I’ll be back in London Monday and I’m sure I’ll have plenty to report. Bactrian Burglars in Bishopsgate: Have you seen Brian the camel? Richmond Park Cull: No Other Option? A new cause for London’s animal lovers — save the deer! Lewisham is Seeing Spots: Measles outbreak due to low vaccination rates. Grape Case Quashed: A man pulls a silly suit on Marks & Spencer and loses. 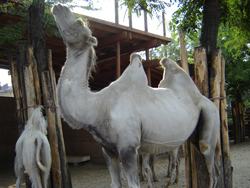 Photo of a Bactrian camel from the Budapest Zoo, July 2007. Brian looks substantially different, but it’s the closest thing I have.